Bought by: CANADA FOUNDRIES & FORGINGS, LTD. The mark DIAMOND G was acquired the Gardiner Tool Co. and then used by the James Smart Mfg. Co. The company actually started as a foundry ror what was frequently called a “novelty works” under the name of the Brockville Novelty Works. It was formed in 1854 by James Smart shortly after he relocated from Scotland. Within a relatively short period the company was renamed the James Smart Manufacturing Company. The company continued to grow quite rapidly necessitating the addition of partners so more capital could be obtained. That resulted in the incorporation of the company in 1881. Over the next three decades four smaller companies were purchased and combined with the parent company. Included in the acquisition of the smaller companies was the Gardiner Tool Co. of Montreal. Gardiner was a forging company that used the trade mark Diamond G. Amongst their products were a line of axes that commanded the highest acclaim. 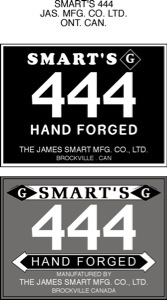 Many of the axes produced after Smart took over the company continued to bear the Diamond G brand, sometimes alone but also in conjunction with the name JAMES SMART or SMART'S. 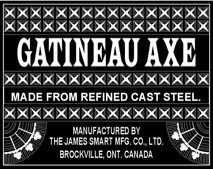 At least two dozen stampings are known that appeared on axes made in the Gardiner plant. Some were marketed with additional paper labels and some were marketed with only stampings. Specialties manufactured by the James Smart Mfg. Co. involved the casting of iron and steel into a wide variety of products from furnaces and stoves to pots and pans used for cooking. The company also made lawn mowers, shovels and the frames for certain types of furniture including the leg and seat framework for wooden desks. They also made axes and associated edge tools as well as hammers. The company provided goods for the domestic market as well as export goods. In 1912 the majority of shares were sold to Canada Foundries and Forgings but the operation continued in the James Smart plant as the both James Smart and Canadian Foundries and & Forgings. The plant continued to be used until 1965. Some accounts indicate the date was 1967 but that may have applied to the legal ownership as actual manufacturing at the Smart plant was last conducted in 1965. The DIAMOND G mark was adapted to some axes intended for sales to French speaking customers. The BEAVER brand was used for an extended period of time resulting in two versions. Some labels were very similar to those used by American wholesalers. That could have been so the labels suggested the axes were made by American manufacturers or Smart may have made them for export to the American wholesalers. 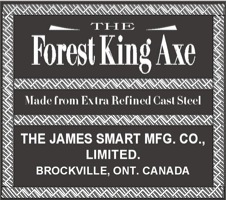 The FOREST KING AXE was a brand used by a number of companies both in Canada and America. Some brands, along with the labels used with those brands suggested ties to other countries in one way or another. Canadian Foundries & Forgings, Ltd. The James Smart Mfg. Co. used a few labels that were not the conventional rectangle or circle shape. Labels depicting a maple leaf were and still are a major symbol of Canada. 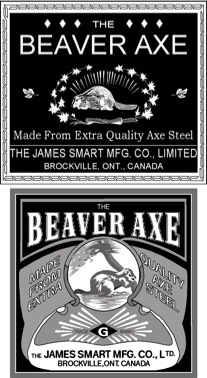 The use of the brand CANADIAN AXE was one of the early brands used by the James Smart Mfg. Co. and carried-on under the same name and with the patent name Whittam.. The James Smart Mfg. Co. used a few labels that reflected patterns and styles similar to those manufactured in America. 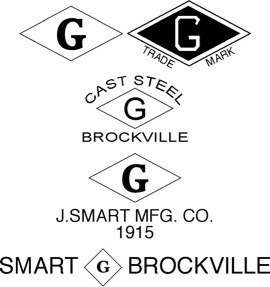 Later brands as being made in the James Smart plant after it formally became the Canadian Foundries And Forging Co. 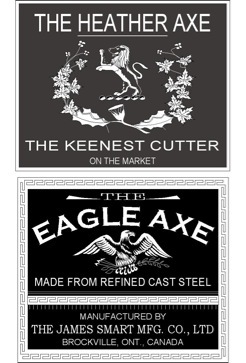 Round labels used on some hatchets and some hammers. Rectangular labels used on some hatchet handles. Brands represented by repetitive numbers were specifically used to compete with a popular Mann Edge Tool brand called the 555. The lettered referring to the 444 was used on some axes in addition to the paper label.